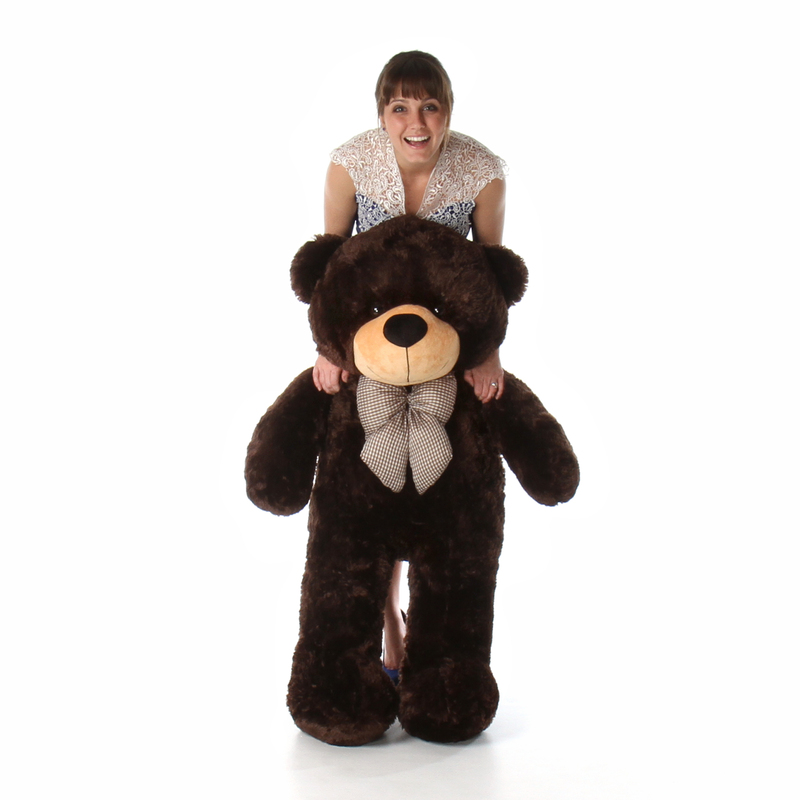 Give the gift of friendship and tenderness with a Giant Teddy stuffed valentine teddy bear like Brownie Cuddles. An extremely soft and huggable huge teddy bear with a heavenly soft chocolate brown teddy bear coat. Its big brown eyes are filled with a lively twinkle, an expression of the love and kindness that extends to Brownie's new home! Its chubby nose is made of smooth velveteen fabric; divinely soothing to the touch. This precious bear measures 46" in height and is also available in larger and smaller sizes in a kaleidoscope of colors. It wears a dashing checkered bow that adds the right touch of whimsy to its design. Being well constructed, durable, made with child safe fabrics and meeting or exceeding all US safety standards guarantees that Brownie Cuddles is perfect for snuggling! A wonderful collectible, as all Giant Teddy bears are! Fun to open! Very huggable! I am very happy with my purchase. I like how it came vacuum packed. I haven't taken it out of the package yet because it is a Christmas gift and I am going to wrap it just the way it is. I sent this teddy to my sister when she wasn't feeling so well. The second she opened up the box, her eyes lit up! This is a definite way to brighten someone's day! You can't go wrong with the snuggly teddy and I would purchase another at the drop of a hat!